Hyderabad, the city which boasts of being named as the best city to travel in 2015 by National Geography, is a place for every tourist. A breathtaking blend of traditions and historical glamour that has been adorned with the modern comfort and luxury, is the city of Hyderabad, one of the most popular tourist destinations in the world. Whether you want to have a romantic vacation with your partner or a relaxing family holiday or a fun trip with your friends, Hyderabad Darshan is for every travel lover. 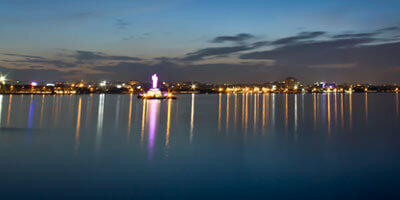 What makes the experience even more enticing is the travel friendly environment of the city. Anyone, from a budget travel to a luxury traveller, can find suitable accommodations and facilities to suit their requirements. One such facility is the special Hyderabad Darshan buses which are offered by the Telangana Tourism, to take visitors around top sightseeing place in Hyderabad. Hence, exploring this ancient city has become even easier and less time consuming. Our hyderabad darshan tour packages not only offer sightseeing places but also an opportunity to participate in an extensive range of activities that will keep you pleasantly engaged such as shopping. Whether you are looking for pearls shopping or intricate Bidri work or for the famous glass bangles, there are ample of places in this city which promises enchanting shopping experiences to all. Laad Bazaar, situated in the Old City, by the side of Charminar, is popular for its glass bangles. People also visit Laad Bazaar for shopping bridal wear and pearls. Hyderabad's Handicraft Emporium offers a range of exquisite Bidri Work such as plates, bowls, vases, ashtrays, trinket boxes, huqqa bases and jewellery. Shilparamam, a tourist village offers not just amazing shopping opportunities but also a glimpse into the rural life of the state. A visit to Hyderabad is something travel lovers should make, at least once in their lives, and we at Holidays DNA are committed to make that visit worth travelling for. 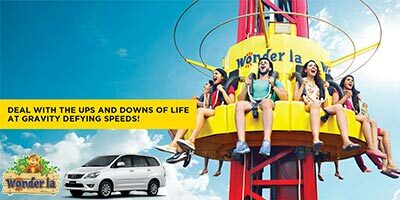 Once in Hyderabad, for taking a tour of the city you can either book city tour cabs or even mini buses, depending on your requirements. 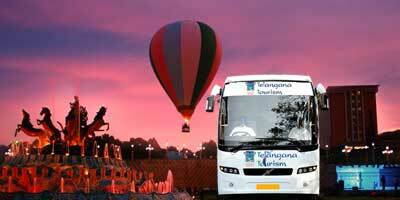 If you are looking for a Hyderabad Darshan bus then Hop On Hop Off Hyderabad buses are the one of the best option available. Being an official partner of the Telangana Tourism, we assist our customers in booking of the tickets along with information on boarding points and other details. 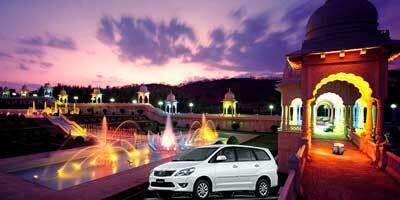 We also have options for Hyderabad Darshan by Cab. With a history which is more than 400 years old, this city of Nizams showcase a wide array of magnificent monuments. The name of this city also denotes a beautiful historical era. It is after Bhagmati who is also known with the name of Hyder Mahal and was the wife of Quli Qutub Shah, the city got its name. This city, with rich its decades old traditions, cultural diversity, world famous cuisines, ancient buildings and modern entertainment choices, creates a splendid setting for a perfect holiday. Built by the founder of Hyderabad, Mohammed Quli Qutb Shah in 1591, Charminar is the most popular landmark of this city. Charminar can be seen as symbolic of the vibrant spirit of this city. Bustling market, streets flooded with people with a historical monument in its backdrop, makes for an experience worth remembering. Some of the other monuments which you can visit with Hyderabad Darshan tour and which have been magnificently beautifying the city are the seven tombs of celebrated Qutub Shahi Kings, Golconda Fort, Taramati Baradari, Chowmahalla Palace and the Falaknuma Palace. The architectural brilliance of these buildings will leave you captivated. 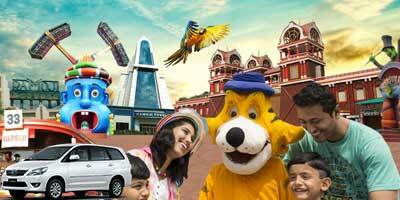 While on a Hyderabad Darshan, a visit to Ramoji Film City is also a must.